QUEENSLAND'S best rugby league players will be in Nanango come July and it is the talk of the town. President of the Nanango Stags Rebecca Jackson said her phone has been running hot since it was announced that the club will host an Intrust Super Cup game this season. The Sunshine Coast Falcons and Norths Devils will face off in Nanango on Sunday, July 21 as part of the leagues country round. "We are super excited not just for the club but for the town and for football in the South Burnett," she said. "Our life members want to be involved and are asking what can they do and everyone seems to be excited so hopefully that will build." It is set to be a big game for Yarraman and Blackbutt junior player Luke Pollock who will return to his roots when he takes the field for the Devils and it will be a test with the Falcons currently the team to beat. 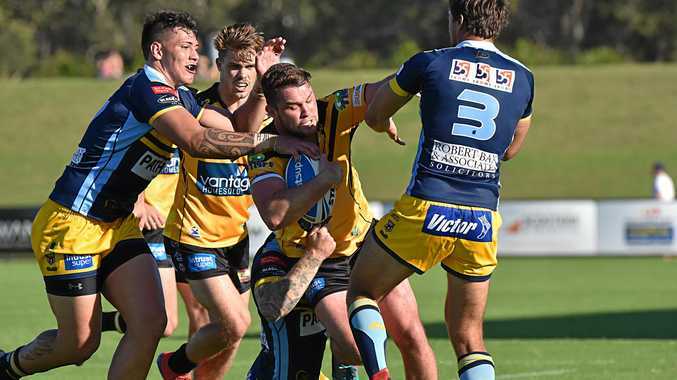 It will be more than a game for Nanango with a whole week of activities planned including a sportsmens lunch or dinner and school visits across the South Burnett. "I've seen first-hand how much joy this event brings to outback communities, as well as our players and coaches who embrace the opportunity to travel far and wide to showcase their skills and engage with local fans," he said. Jackson said that while the club is excited there is a lot of work to be done in the next three months including updating the club's dressing sheds. "We have got a lot of hard work ahead of us but I am sure we have got enough volunteers around the town and club to help us out," she said. The club are organising for the South Burnett women's team to play on the day and Jackson said there was the potential for a Nanango and Kingaroy exhibition match to be played. While thousands are expected to be on the sideline fans from afar will not miss the action in Nanango with the game set to be televised on Channel 9. The finer details of the game and activities are yet to be finalised with the club to meet with Queensland Rugby League in coming weeks.